“I was on drugs, dude,” the producer told Rolling Stone. Timbaland has spoken for the first time about a drug addiction that he feared would end his life. The producer spoke to Rolling Stone about a serious OxyContin habit that began while recovering from nerve damage sustained from a gunshot wound he received as a teenager. He said that this, teamed with a downturn in fortune in his career during the past few years, combined to a dangerous degree. Timbaland was ostensibly talking to Rolling Stone to discuss his work in the studio, which includes sessions with JAY-Z, Zayn Malik, Wiz Khalifa, and Justin Timberlake's new album. “The music we just made? 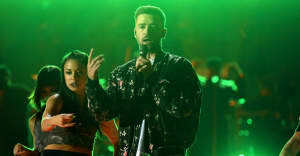 It’s gonna put him on another plateau,” the producer said of Timberlake.